As soon as the inaugural festivities are over, President-elect Rodrigo Duterte’s administration will begin preparing for one of the most important diplomatic events of his presidency: the 2017 Philippine chairmanship of ASEAN. Not only will the occasion be significant for the country, it will also be milestone for the organization, which will celebrate the 50th anniversary of its founding during Manila’s watch. Among the anticipated gatherings for that year are the ASEAN Defense Ministers Meeting (ADMM), and the ADMM-Plus. Remarkably, compared with other ASEAN platforms, the ADMM has expanded swiftly. As one scholar pointed out, “Within a span of merely a little bit of more than four years and with just eight meetings, the ADMM has expanded to include eight of ASEAN’s dialogue partners into what is now known as the ADMM-Plus.” For the Philippines, the 10th ADMM, held in May 2016 in Laos, was largely a success, with Manila’s proposal of creating a cybersecurity expert working group (EWG) for the ADMM-Plus being adopted during the meeting. Notwithstanding these achievements, however, these ASEAN-led platforms are facing challenges. The foremost strategic concern is the emerging regional power shift in the Asia-Pacific, with the South China Sea dispute as the operational theater. The issue has exposed some indications of ASEAN’s divisions, and thus appears to threaten the group’s centrality in the regional security architecture. Indeed, the maritime dispute was the reason why the 3rd ADMM-Plus, in which the United States and China are members, failed to issue a joint statement. Another strategic challenge is the seeming deficiency of functional cooperation initiatives to address traditional security concerns. Functional cooperation theorist Ernst Hass argued that “it would contribute to world peace by creating ever-expanding islands of practical cooperation, eventually spilling over into the controversy-laden fields.” Such an approach was apparent in the ADMM when the ministers agreed to “develop practical cooperation among them in the field of defense and security.” However, there has yet to be a clear and definitive indication that the ASEAN and its dialogue partners have moved toward cooperation on more contentious geopolitical issues. In view of these challenges, there have been calls for the ADMM and ADMM-Plus to focus more on traditional security concerns. While such shift has a strategic imperative and indeed necessity, it will not be easy because of the varying politico-security and economic interests of the member-states. The existing challenges seem to suggest that the two platforms have severe limits and constraints and therefore cannot move more proactively in addressing the pressing security concerns of the region. Moreover, these challenges are likely to go beyond the hosting of multilateral activities by one country. In this context, the Duterte administration is faced by a defense diplomacy conundrum. On the one hand, Manila’s leadership must be able to project the strategic significance of these platforms in the regional security architecture by addressing not only non-traditional security concerns, but traditional issues as well. Such a move is important because of the evolving regional security landscape. But on the other hand, an attempt to address geostrategic issues, such as the South China Sea, risks the unraveling of ASEAN centrality. Manila must therefore prevent a repeat of the 2015 ADMM-Plus, where no joint statement was issued. Clearly, the Philippines must strike a careful balance between these important considerations as it hosts the two regional defense platforms. In this regard, the Philippines’ chairmanship may focus on conducting a comprehensive review of the accomplishments made thus far by the ADMM and the ADMM-Plus. In particular, Manila may lead other defense ministers in assessing the achievements made under its Three-Year Work Programs, first issued in 2007, which identify key activities to be undertaken throughout the said time frame. Such a proposal is timely because the next work program will be issued under Manila’s stewardship. With respect to the ADMM-Plus, an evaluation of the efforts of the EWGs may likewise be thoroughly discussed. Overall, a systematic review of the achievements of the ADMM and ADMM-Plus will disclose how profound the practical cooperation approach is and whether the same will eventually “spill over” to geostrategic regional concerns. 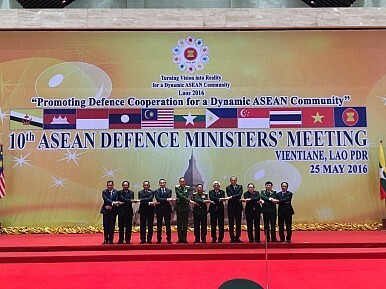 ASEAN Defense Meeting Puts Terrorism in the SpotlightASEAN Defense Ministers Sign Security DeclarationWhat’s in the New ASEAN Air Encounter Code?ASEAN Terrorism Challenge in the Spotlight with Singapore SymposiumWhere Are ASEAN’s Defense Initiatives Under Singapore’s Chairmanship?